Featured here is a sulky hay rake. This photo was taken at an auction in 1999 and the rake is incomplete in that the tongue is missing. It is sort of standing on its nose as you can tell by the position of the seat. Also note that the teeth don't reach the Ground. The reason that the tongue is missing is likely because it was made of wood. This is a classic design for a hay rake which was commonly pulled by a team of horses. The seat provided a place for the operator to both drive the team and operate the rake. The teeth drag along the ground collecting hay until the teeth are full. The teeth are then lifted leaving their collection in a pile. As the farmer drives around and around the field, the teeth are raised in the same place each time so the hay is collected in what is known as a windrow. Unlike a side delivery rake which leaves a windrow parallel to the direction of travel, this sort of rake leaves a windrow crossways to the direction of travel. This 'crossways' windrow is the reason that this rake fell into disuse when the pickup baler became common. The haybaler of the last 50 years works by following the windrow around and around the field in an inward spiral, making this sort of rake completely unsuitable. Back in the days when hay was transported to the barn as 'loose hay', often by being pitched on wagons by hand with pitch forks this sort of a rake worked just fine, and was a step forward from gathering the hay up as it was mowed and piling it by hand -- usually in shocks. The Mechanically interesting thing about one of these rakes is that many models of them had a 'power trip' mechanism on them so the operator did not have to lift the teeth by hand. 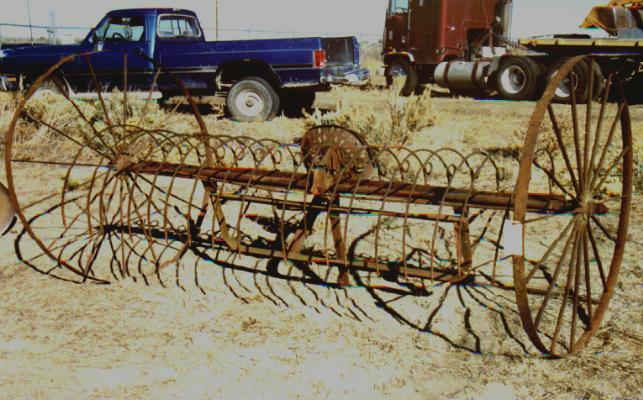 Most versions of rakes like this I have seen had a dog clutch in the wheel hubs, and when activated, usually by a foot pedal, the rod to which the teeth were attached would catch in the wheel hub and left up the teeth until the hay dropped free and then the teeth would drop again. After wheel tractors became common many of these rakes were adapted to pull behind wheel tractors and then often a trip rope was extended up so the tractor driver could pull the trip rope to trip the rake and dump the hay. Besides leaving the windrow crossways to the direction of travel a rake such as this tended to drag the hay great distances and also to compress and pack it into the cavity of the teeth. If the hay was not fully dry when raked it was very hard to get it to dry in these compressed piles. Likewise the long distance drag tended to break the leaves and otherwise damage the crop. 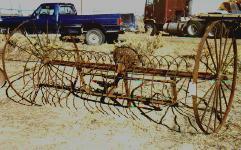 IT was also impossible to 'roll a windrow over' with one of these rakes. This is critical if you are trying to get hay dry in a wet climate as the hay will draw dampness from the ground at night, and you need to roll over the windows so the wet bottom can dry up. Side delivery rakes, by contrast never move the hay more than about 8 feet and do so by lifting and kicking it over so the hay is fluffed up. This improves air circulation and drying, and if the window needs to be 'rolled over' you can bump the windrow with the edge of the rake and just roll it over on some subsequent occasion if the hay ends up wet on the bottom and dry on top. The bottom line is that most rakes of this type have been parked for 50 years and rusting, which also explains the missing wooden tongue. There is simply no function for a rake like this today except as an ornament in the weed patch behind the barn.